The Olson Saw Co. has been a leading manufacturer of bandsaw blades in the United States for over 80 years. 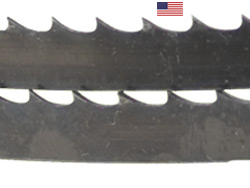 These Hard Edge Flex Back Blades are made of .025 thick blade stock with teeth hardened to between 62 to 63 Rc. All blades are Factory Welded accurately to the sizes offered. All the blades we offer have a Hook Tooth design with 3 or 4 teeth per inch making them excellent for cutting thicker woods like bowl blanks.